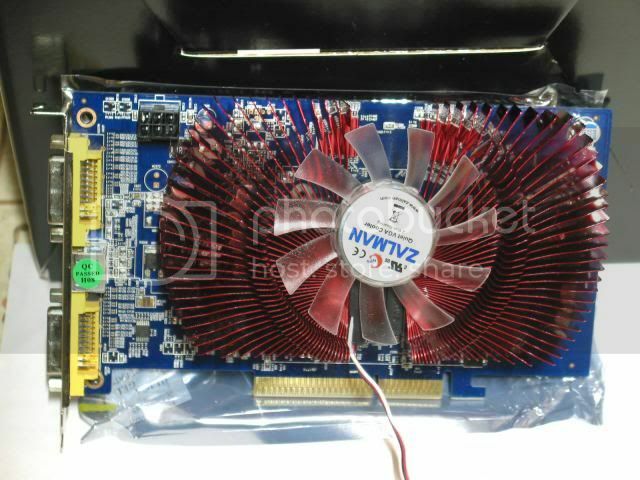 New HD 4650 AGP for my gamer :)! Brought home a new video card for my gamer today. 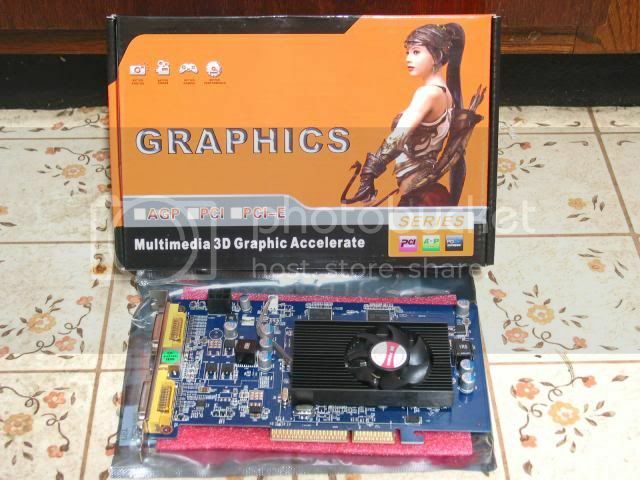 A Radeon HD4650 1GB DDR2 AGP direct from China. I'm expecting it to be a respectable upgrade from my 9800 Pro VIVO 256MB (originally a 12 pipe 9800, but installing the Pro BIOS unlocked the other 4 pipes.) 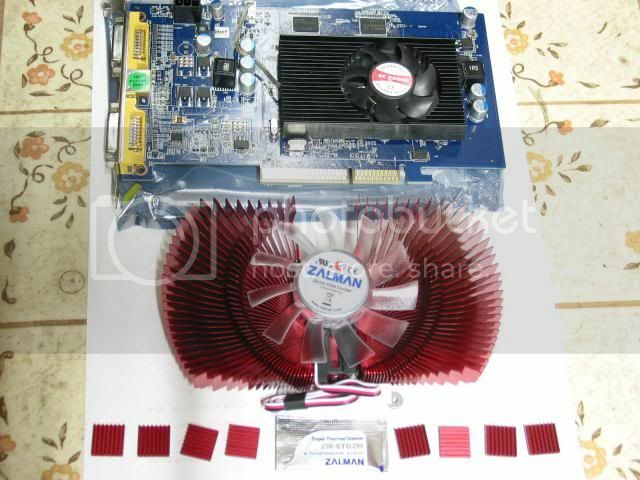 Was wondering if I could install my spare Zalman Copper Flower heatsink on it, but I see it uses a four point mount, rather than the Zalman two. 'Course, don't know if the card would benefit much anyway. I definitely appreciate the hot Chinese babe with the bow ! 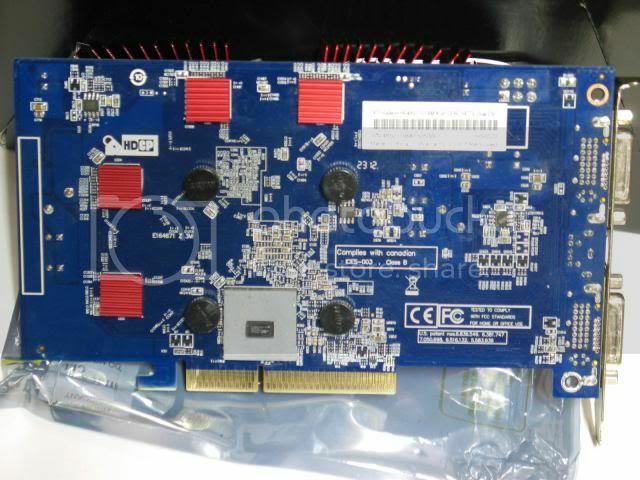 Need to find out what o/c tools are used for AMD/ATI cards these days. Confused, just looking at some comparisons between the 4650 and 4670 and the performance difference is striking and I could have paid about $15 more for a 4670. However, when I look at the seller descriptions of the cards, they have the same memory and clocks, which was why I went with the 4650 to begin with. Wonder if those descriptions are wrong? Still, it's looking like I really do need to come up with good overclocking tools. I know about Rivatuner (though haven't used it yet), is that the tool to use or are there better ones? The old ATI-Tool and modded drivers were great, but I got the impression they stopped keeping up not long after the x---- series boards appeared. Last edited by TrevorS; 18th June, 2013 at 07:51 PM. Reason: Corrected bad photo link! I hate to say it TreverS but try ATI forums...we mostly use Nvidia here and our low traffic isn't helpful either. Last edited by Daniel ~; 31st May, 2013 at 06:47 PM. Thanks Daniel, guess I'll do that, I probably already have a membership over there, just don't recall ! I did stumble into the ATI-Tool forum and as I thought, those tool's are no longer maintained. Passage of time really changes the world, kind of an adventure I guess ! BOY! Tell me about it. Over-clocking a CPU COMPLETELY changed for Intel with the Z77 chip set and the i7 CPU! Installed the card last night and learned from GPU-Z the memory clock is 400MHz shy of the advertized 800MHz. Was planning to overclock a little (ordered a Zalman aluminum heat sink yesterday), but anywhere near 400Mhz is expecting a bit much. Sent the seller a note and will see what I hear. Which is to say it may ramp up in speed to meet a need and then ramp back down when it no longer has as much demand placed upon it. Interesting, hadn't heard of that for video cards (only recently learned of it for GPUs). It's not in the seller description, so I'll see what I can learn elsewhere. I'll also check the XFX 7770 I just bought, see what clock GPU-Z reports. I gather this is a Nvidia card feature? Just been reading about something AMD calls "PowerTune" which manages the voltage and clock internally to the GPU. It was apparently preceded by "PowerPlay" which did much the same except for having a fixed GPU clock upper limit. Both being intended to constrain power consumption to theoretical boundaries (TDP). However, those being GPU specific, that still leaves the memory clock which may remain an overclock possibility. For the PowerPlay cards, perhaps the top GPU clock setting is adjustable, that should include the 4650. Now my elsewhere mentioned build issues seem to have settled down, perhaps it's time to dig into modern AMD card overclocking techniques and tools. If both Chinese 4600 Series cards are using the same DDR2 chips, could be the DRAM clock can be shoved up a lot. However, if the $15 more expensive card is using different memory, then likely not. Time for more reading ! Last edited by TrevorS; 1st June, 2013 at 11:37 PM. "Adaptive" is what Asus Motherboards and Nvidia cards calls this power saving feature. Last edited by Daniel ~; 2nd June, 2013 at 09:40 PM. Learned three things about the PowerPlay cards. 1) Both GPU and DRAM clock are controlled by the GPU. 2) The upper limit clock of both is adjustable. 3) The clocks, GPU voltage, and fan speed behavior can all be changed. I also learned that between the X2 4200+ CPU demand and that of an overclocked 4650 card, my 480W power supply is getting into trouble. Fortunately, I've a new 550W waiting in the wings. I found several Radeon compatible o/c utilities and tried them, but all but one limited the top GPU clock to 712MHz, couldn't find a way past it (default is 600MHz). The tools I found are AMD Overdrive (part of AMD Catalyst Control), Asus GPU Tweak, ATI Tray Tools, Gigabyte OC Guru, MSI Afterburner (latest appears limited to MSI cards), and Sapphire Trixx. The one I've thus far settled on is ATI Tray Tools (similar to the old ATI Tool I previously used, but more flexible for today's cards). Found the thermal test results of AMD Overdrive and Tray Tools agreed and artifact behavior was confirmed by 3Dmark06, so they're both good (didn't do any thermal testing with the others). Turns out the 4650 memory could only be raised to 495MHz before pixel errors began (default is 400MHz), so that's disappointing -- expect the chips are rated 500Mhz. As such, any of the above tools would do for the memory. However, the GPU clock hit the apparently standardized slider limit of 712MHz very easily, so I need something that allows me beyond it and ATI Tray Tools does. I fooled with GPU o/c for several hours and it's capable of plenty of clock and at easily less voltage than OE, but what I'm seeing is although a better heatsink will help push it up (also higher fan speeds), the primary performance impediment is proving to be the slow DRAM. Wish it was the advertised 800MHz ! Last edited by TrevorS; 3rd June, 2013 at 08:29 PM. wow I clicked the "ebay" link in your first post and the card in your photo is totally different. Did you create that Ebay link or did the forum automatically do it? honestly, I don't over-clock anything. I've always read (and been told) that overclocking reduces the life-span of hardware. I prefer my hardware lasting many 10's of years, even if i give it away, i would like the next owner to have a reliable piece of hardware. The only tweak I ever did was with the ATI 9800 SE which could be unlocked to allow 4 more pipes. And it worked! Man I havn't used that card in years. Good ole AGP! I actually played Ghost Recon Advanced Warfighter on that card. Myth: Over clocking reduces hardware life. Truth: Heat and heat alone reduces hardware life. If you can run cool enough your over clock parts will most likely out live parts run at standard settings and temps. All it takes is a fan failure to kill your overclocked hardware or a drip of water from your cooling system to destroy it all! CPU fan failure could potentially kill most processors, o/c'd or not. Though you've got me a little confused, isn't this supposed to be the "Alliance of Overclocking Arts" forum? Is it you or me that took the wrong turn? Hmm, looks like the heat sink should arrive tomorrow. Last edited by TrevorS; 3rd June, 2013 at 11:16 PM. Belive me... it was Me! I was never an overclocker, but am a total computer geek. I have 6 gaming computers, a laptop, netbook & a server. I also work in IT so I get a lot of older computers. I refurbish them and donate them. On top of that, I am a PC Game collector and now use Linux as my main Operating System. so I have been using my collection to test PC games in Linux and create guides on how to get them running. So, overclocker or not, I love it here at AOA because its a tight community, members are always online and there's lots to talk about. All it takes is a fan failure to kill your over-clocked hardware or a drip of water from your cooling system to destroy it all! Myth: A drop of water will kill it all. Truth: I've had exactly one Water mishap, in 12 years... my own stupidity pumped water all over my Video card and motherboard,while she was starting up... shorted it and shut it down. I dried every thing with a hair blower and Bang she was good to go. Do you really think your going to be OK if a CPU fan fails? I don't. Neither does my water cooling system with it's auto shut down, temp controlled...just like the one in my Asus mother board. Temp controlled auto shut down ...been around for awhile now Boo. Last edited by Daniel ~; 4th June, 2013 at 10:49 PM. I'm a paranoid user... I am not willing to take those kind of risks. I know BIOS is able to shutdown the system before an overheat occurs, but at the same time... random shutdowns can corrupt your operating system, programs and files. My basic goal is build affordable machines that play games and run programs... then make them last. I can't afford the risks and most people can't either. I can't believe that system still worked after splashing water on it! I like to o/c where I can see a benefit and if it doesn't require significant arm twisting (I'm not very keen on pushing voltages). CPU o/c and SETI crunching went together well in the day, just took a lot of testing to make sure the calculations were definitely good (continuous Prime passes). It's not too hard to swap a video card heat sink and raise the clocks as long as tools are available and the silicon is cooperative. Some silicon at stock are already near the edge, others have plenty of range left, just depends on luck and the binning. O/c isn't necessarily a question of pushing the silicon's capability, it can also be just exploring its native ability. My GPU above will easily reach 750MHz undervolt, it just needs help with the heat dissipation and a stiffer power supply. 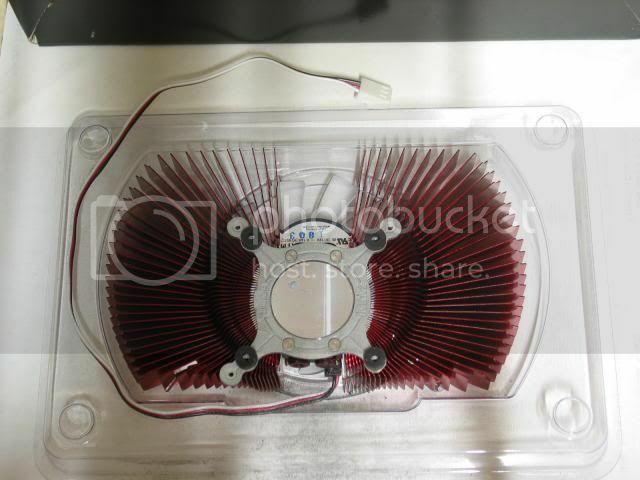 Stock heat sink is intended for stock use. The memory, however, is looking pretty hopeless. Perhaps it can go up a little higher than 495MHz by applying voltage, but that would require a board mod and if they're rated at 500MHz, I don't see much point. Just swapped the 550W PS in so after the heat sink arrives, I can experiment some more, but it's probably pretty much futile thanks to the memory limitation. The benchmark improvement between 712 and 750MHz was pretty minor, whereas from 600 to 712 was striking, gains clearly diminish as clock increases after memory max. In fact, it's questionable upgrading the HSF, I could just stay at the slider 712MHz and be done with it. However, it's hard to know if you don't try and I ordered the Zalman with hopes running up the GPU would have greater benefit, the additional cooling may yet help a little with the memory, but I'm not counting on it. The more memory chips there are, the more statistics work against you. You do realize that both Intel and Asus not only bless, but warranty my set up? That THEY designed it to be over clocked? We are at what many consider to be the end of over clocking.. the Reason? Or just do what you feel... But the risks for anyone whose willing to learn a discipline approach is all but nil... about the same as turning on your computer in the morning as opposed to leaving it running all night. Last edited by Daniel ~; 5th June, 2013 at 06:14 PM. Zalman HS arrived today and so I installed it. Part way through I found one of the mounting arms collided with a clock crystal on the face of the card and so I had to use a Dremel to remove the tip. Here are a few photos. As always, a pretty heat sink, and it made a huge difference in cooling! What was a 53-54C idle moved to 34-35C (fan on low). Peak dropped from about 72C at ~750MHz GPU to about 49C. Heat is no longer an issue, in fact, a tad overkill I'm thinking. Seems like the memory is too slow for the GPU clocking to really pay off, but still, a ~25% gain. Maybe I can sneak a little more DRAM speed as the adhesive cures. Guess as long as I stick to 1024x768 and modest settings, it should be OK. Really unfortunate thing is I don't see any drivers for Win98SE (my gamer's dual boot)! Yeehaa! Heaven Benchmark score of 147 with a 5.8fps average! Last edited by TrevorS; 6th June, 2013 at 12:56 AM. Installed the card last night and learned from GPU-Z the memory clock is 400MHz shy of the advertized 800MHz. Surely the memory clock speed is supposed to be 400 MHz? 800 Mhz would be the effective speed given that it has a double data rate bus.